Continuing on from my post two weeks ago, about the alterations in modern editions I’ve now looked at chapters three and four of Five on a Treasure Island. The first edit in this chapter is in the title, as in the modern edition it has become a peculiar story. There’s often talk about Blyton over-using the word queer anyway, though in the first four chapters I’ve only found it used four times. Incidentally I was reading Prince Caspian, from the Chronicles of Narnia series, by C.S. Lewis this week too, first published in 1951, I read a paperback from 1996. I counted queer or variations of it seven times, used by both the characters and the narrator. “This is the queerest thing I ever heard,” – Trumpkin. It’s interesting that some works receive such “modernisation” while other classics from a similar period are left alone. Back to the Five, the fourth instance of queer is the siblings thinking George was the queerest girl they had even known, and again it becomes most peculiar. Again a reference to spanking has been removed, did you get spanked has become did you get told off? The other changes in this chapter are minor; Anne gets a lick on the nose from Timmy instead of a wet lick. Goodness knows why they thought it was necessary to remove the word wet there though, and some of the old-fashioned flavour is lost when George’s mother’s people become simply her family. Chapter four earns the dubious distinction of being the most edited chapter so far, as I’ve spotted eight changes (not counting the removal of hyphens). There are three in relation to their clothing, as with the earlier chapters shorts are jeans again, and in addition, Julian’s bathing-suit becomes his swimming trunks. After that his and George’s bathing-suits are referred to as bathing costumes. 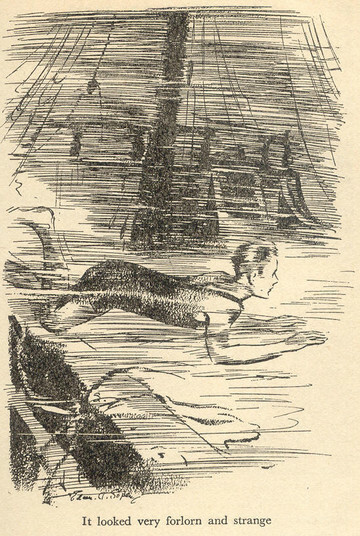 Of course the original illustration on the opposite page in the paperback still shows Julian swimming in his bathing suit, the sort that has shorts and a top with straps. Twice the sulks becomes a sulk, firstly when Aunt Fanny says she expects George will go into the sulks, and again when the other children don’t mind George going into the sulks. I suppose a singular sulk is more common these days, but the sulks is hardly something modern children wouldn’t understand, is it? One change I feel is particularly wrong (rather than just silly or pointless) is the fact the modern edition has removed Master when Alf the fisher boy is talking to George. I understand that children are no longer called Master Julian and Miss/tress Anne etc, but it’s quite an important character point, that George is treated as a boy and referred to as such. Those who either know how important that is to her, or who have truly mistaken her for a boy call her Master George, something that really pleases her. A final pointless change in my eyes is altering her face lighted up to her face lit up. Lit/lighted are both correct as far as I am aware, for example she lit the lamp and she lighted the lamp should be equally acceptable. Though lighted might be a more old-fashioned term the meaning is still completely clear. So that brings us to the end of chapter four! That’s 13 changes in those two chapters, and 24 altogether so far for anyone who’s interested in the numbers. Again, please comment with your opinions on these alterations, whether you’re for or against. This entry was posted in Updating Blyton's Books and tagged C.S. Lewis, Five on a Treasure Island, Prince Caspian, Updates. Bookmark the permalink. I think these changes, without exception, are just completely pointless: ranging from petty and silly changes, to objectionable manifestations of political correctness – and this just underlines why I never buy or read editions of Enid Blyton’s work after about 1970 if I can possibly help it. I am writing an adventure novel of my own (with my own characters, not related to Blyton characters or series in any way), and, in certain early school scenes, corporal punishment is mentioned. I have a feeling that the plot won’t call for it to be actually used, but it’s mentioned because it’s part of the way that rather stiff, strict, traditional boarding school operates; and I’d be blowed if I’d let editors bowdlerize it out of the story because of modern concerns about political correctness. So I just see it as silly to remove references to spanking in “Five on a Treasure Island”, to replace them with limp, ineffectual mentions of being “told off”. This seems a bit like changing Dame Slap in another series to Dame Snap, and saying how she merely “snaps” at children, rather than slapping them. The silly thing is that we pretend that no parents spank their children nowadays – whereas I bet huge numbers of them still do, even if they keep quiet about it now. Some “how to write guides” have stated that any whiff of political correctness is absolute death to good writing, and urge writers to tell things how they really are. You are doing us a valuable service, Fiona, in highlighting changes that are really pointless as has been mentioned. You can imagine these meddlesome people feeling self- important as they ‘improve’ Enid’s work. Can you imagine Enid’s reaction to these changes to her text – she would be very angry and rightfully so. It seems to be ‘open season’ on Enid Blyton and her works. Same here. I also think the changes were superfluous.